Keeping our Kids Safe! The Need for Sidewalks on Manchester Blvd. Sidewalks are needed on Manchester Blvd both North and South sides of the street. 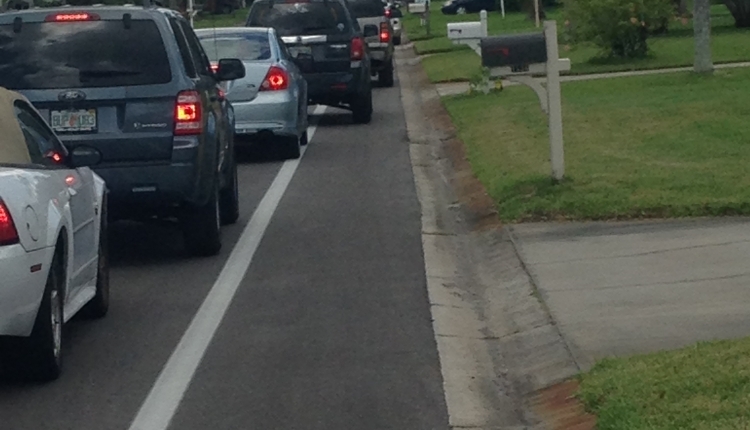 The sidewalks need to start where Tanglewood Blvd turns into Machester Blvd. and continue on the South side of the street to Selby Dr. and on the North side up to the bridge over Covington Cir E.
The current width of the road from where Manchester Blvd starts is 8’2” and the bike path is 3’11”. The road changes once you get to Selby Dr./Covington Cir E. to 9’4” and the bike path is 2’11”. Having the bike path painted on a minimal standard road does not leave the cars a choice, but to go into the bike path. In the morning & afternoon, the entire bike path down the South side of Manchester Blvd. is blocked by cars waiting in the parent drop-off/pickup line. This causes ped/bikers to use the North side of Manchester Blvd. going and coming from school. The North side is the side of the street that always has moving vehicles that veer into the ped/bike path. There are bike paths on both sides of the street, however, when two vehicles pass each other at the same time both vehicles veer into the bike lane. This forces any pedestrian or bike to veer into the grass. Going up into the grass is a trip hazard because it is above the roadway. We understand you have many requests for funding projects. This is a safety issue and we know funds are limited. We are asking you to prioritize this project for the safety of all of the children in the neighborhood. We, the undersigned, call on the Bicycle/Pedestrian Advisory Committee (BPAC), Lee County, Florida District 2 Commissioner -Cecil Pendergrass, Lee County Manager: Roger Desjarlais, to put our children's safety first by putting in sidewalks on Manchester Blvd. near Tanglewood Elementary School. We, the undersigned, ask this be brought to the forefront and completed in the next year before an injury or worse a death occurs. The Keeping our Kids Safe! The Need for Sidewalks on Manchester Blvd. petition to Bicycle/Pedestrian Advisory Committee (BPAC), Cecil Pendergrass, Roger Desjarlais was written by Jennifer Magas and is in the category Roads & Transport at GoPetition.